R&D Capital Expenditure & R&D Allowances - Don't Miss Out! Home » News » R&D capital expenditure and R&D allowances – are you missing out on valuable deductions? Failure to recognize how capital allowances and R&D tax incentives can compare and interact can be costly. Expert advice is often required to ensure you aren’t missing out on a substantial benefit. In this article we explain R&D capital allowances and share some of our expert advice with you. 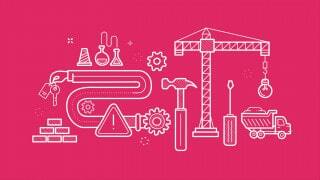 What are R&D capital allowances (RDAs)? R&D capital allowances provide a valuable deduction for capital expenditure on R&D, on assets used for R&D purposes, or on providing facilities for carrying out R&D. RDAs rely on the same definition of R&D as R&D tax credits. This means: if your company is taking a risk by developing new products, processes, materials, or services (or improving existing ones) and, in doing so, spending money on capital assets, you could claim RDAs. Research and development allowances (RDAs) offer a 100% deduction for tax purposes. This means that companies may be missing out on a significant benefit if they do not consider whether their capital expenditure qualifies for RDAs. What capital allowances currently exist? There are a number of different types of capital allowances, depending on the nature and amount of your expenditure. These include: Plant and Machinery Allowances (PMAs), AIA (the Annual Investment Allowance), and RDAs. The type of capital allowance your expenditure qualifies for will dictate the rate at which it can be deducted for tax purposes. Your capital expenditure may fall into more than one category, so it is important to understand all of the categories in order to maximize your capital allowance benefit. For example, an item of machinery may be eligible for PMAs; this would mean that 18% of the cost could be deducted each year. The machinery may also fall within the AIA, which would enable it to be deducted in full in the year it was purchased. If it was used for R&D purposes, it might also qualify for RDAs which would also result in a 100% deduction. Deciding which type of capital allowance is most beneficial to your company often requires the specialist expertise of your accountant or tax adviser. How do other capital allowances compare with R&D capital allowances (RDAs)? Qualifying expenditure for RDAs includes the cost of purchasing capital equipment – usually this will be machinery and other assets for use in R&D activities. But it also includes expenditure on providing facilities for carrying out R&D; this could be building, extending, refurbishing, and sometimes purchasing property in which R&D activities take place. Say you are building, extending, or refurbishing a building where R&D work is being (or will be) carried out; elements of the building work might qualify for varying rates of relief as part of other capital allowances. In the following worked example, we show how using capital allowances with RDAs can deliver extra value – in this case a further £17,290. Because if this building is used for R&D activities, the capital allowances available can be maximised. Plant and machinery expenditure will attract the AIA (up to £200,000), or PMAs at 18% or 8% (depending on the type of asset). In the above example, the plant, equipment and fixtures & fittings (F&F) are all eligible for PMA and the AIA. So before considering RDAs, £200,000 of the total spend on these items has been allocated to the AIA, with the balance attracting PMAs at 18%. How do R&D expenditure, RDAs and other capital allowances interact? R&D expenditure includes a company’s revenue and capital expenditure on R&D. Revenue R&D expenditure attracts relief through R&D tax credits, provided it meets the rules of the R&D tax credit incentives. But if your capital assets are involved in your R&D work, then you should consider whether it may be more beneficial to claim RDAs rather than using other capital allowances. Sometimes revenue expenditure which is capitalized in your accounts is used for R&D purposes. In such cases it can be eligible for relief as part of your R&D tax credit claim. It will never fall into both R&D tax credits and RDAs. By contrast, there is no limit on RDAs. So for companies spending in excess of £200,000 on plant and machinery that is used for R&D purposes, RDAs may offer a more substantial benefit. Importantly: RDAs can also include build-costs which do not generally attract any other form of tax deduction. The key factor you should consider here is whether – and to what extent – the capital assets are used in your company’s ‘R&D activities’. 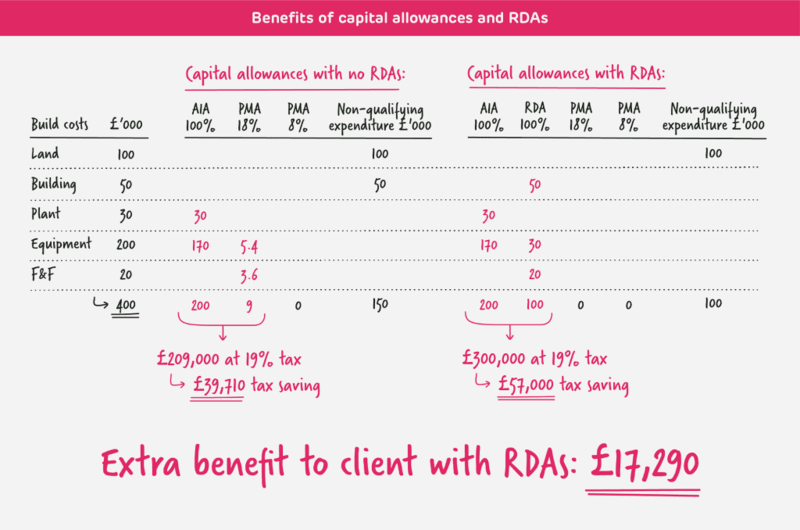 Depending on your business, claiming RDAs could be more beneficial than using the other lower-rate capital allowance structures. You can choose which capital allowance you claim on your capital expenditure (if it qualifies for all three types, it’s up to you to choose the most beneficial). The most beneficial route will be different for each company. This means that expert advice will be needed to properly identify the most beneficial route. To clarify these concepts, we’ve created a hypothetical case study that illustrates the interaction between RDAs and R&D tax credits. Happy Engineering Ltd has owned the factory where it operates for a number of years. Happy contacts a firm of R&D tax credit specialists about making claims for its manufacturing development work. The company subsequently goes on to make three successful claims, generating R&D tax credits of around £150,000. Happy decides to use this money to invest in furthering its manufacturing capabilities. The company purchases new manufacturing equipment which requires an extension of the factory. In all, Happy spends £200,000 on the building work and new equipment, as well as a further £50,000 in labour costs to get the machinery up and running and working efficiently. Happy’s R&D tax credit adviser investigates the eligibility of the labour costs for R&D tax credits, whilst Happy’s accountant prepares the company tax return and capital allowances calculation. As a result, equipment and other plant totalling £100,000 is allocated to the AIA and deducted in full. The balance of the capital expenditure, relating to the building work, is not deducted for tax purposes. Had Happy made the link between its R&D activities and its capital expenditure, it might have spotted that some of its equipment is used for R&D purposes. Such equipment is used during manufacturing trials and – more importantly – the factory provides the facilities for carrying out R&D: the same R&D for which it is making R&D tax relief claims. Although the equipment and the facility are also used for normal manufacturing activities (not R&D), a proportion of the capital expenditure should be eligible for RDAs at 100%. This is a valuable deduction to have missed. Happy’s R&D tax adviser visited the site during preparation of the R&D tax credit claim and spotted the new factory extension and equipment. As a result, they explained the possibility of claiming RDAs. The adviser then went on to work with the company’s accountant to apportion the costs, based on the work done to prepare the R&D tax relief claim. As a result of this approach, £45,000 of the previously unrelieved build-costs were allocated to RDAs. This increased the total capital allowances claimed to £145,000, saving additional tax of £8,550 (at 19%). The labour costs are revenue expenditure attributable to an R&D project, and therefore attracted R&D tax credits, resulting in an additional tax saving of £12,350. By making the link between R&D activities and capital expenditure, Happy was able to access a total additional tax saving of £20,900. A happy result. What does this mean for your innovative company? Because RDAs rely on the same definition of R&D as R&D tax credits, any innovative business claiming capital allowances should consider expert advice to ensure they maximize their benefits. RDAs can’t always increase the value of your capital allowances claim, but if you miss the deadline for claiming (two years after the end of the accounting period), you have missed your chance permanently. And, if you are a larger business and you have been making an R&D tax credit claim, you might have missed out on this added value if this has not been properly considered. It goes without saying that you should always get specialist advice on your R&D activities. And there are a number of things you should consider when choosing a new R&D tax credit adviser. At ForrestBrown our team of chartered tax advisers are often able to identify expenditure that qualifies for RDAs that other advisers have missed. Contact us now for a no-obligation chat about your R&D work.